goodness, gracious, me ! Well at least he wont look as bad as jocelyn wildenstein. Jocelyn really had it made. She was a fresh-faced mother of two and married to an extremely rich art dealer. That is until she caught her husband in bed with a 21 year old Russian model. Now, any normal person would just leave her husband and take all of his money with her, right? 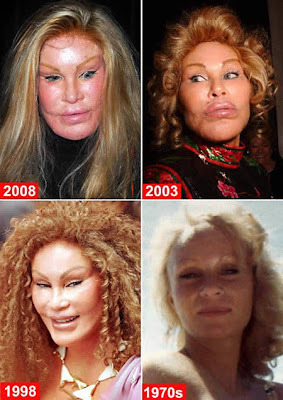 Not Jocelyn Wildenstein! Instead she decided to win back her husbands love and make herself more beautiful by going under the knife. Well, her husband left her anyways, but Jocelyn will always have her plastic surgeon.